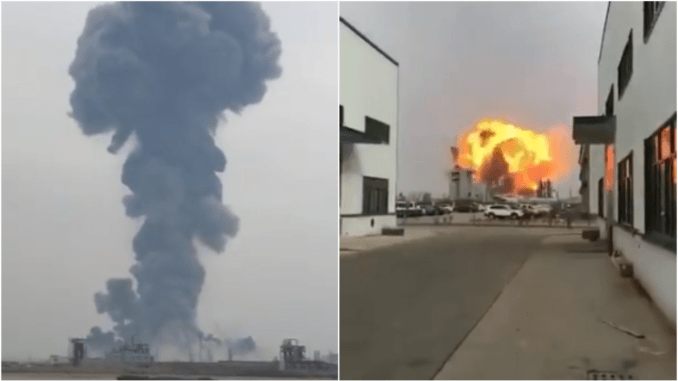 Six people were killed in a blast at a chemical plant in Yancheng, which is in eastern China, 1157 kilometers away from Beijing. The explosion took place in the afternoon at 2:50 pm local time, thirty people were injured. A fire in the factory caused the blast, the factory makes fertilizers. Chinese seismologist reported a tremor of 2.2 magnitude at the time of the explosion. Images of fireballs went viral on social media, smoke clouds were seen enveloping the area. Local state news reported that the blasts brought down neighbouring factory buildings. Prominent newspaper South China Morning Post said that the factory involved Tianjiayi Chemical, founded in 2007, received six government penalties in the past over waste management and air pollution. Safety regulations and guidelines are very loose in China, even if they are present they aren’t enforced. In 2015, more than 160 people died after two hazardous chemical explosion rocked northern China’s port of Tianjin.